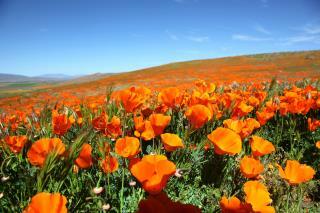 (Newser) – Walker Canyon in Southern California is filled with blooming poppies—providing a rolling, orange view that extends as far as the eye can see—but as of Sunday, it's no longer filled with visitors. Lake Elsinore tried to accommodate the thousands of "super bloom" tourists by bringing in traffic controllers and shuttle buses, per the Times of San Diego, but things got out of hand. "The situation has escalated beyond our available resources," the City of Lake Elsinore posted on Instagram. "This weekend has been unbearable." Mayor Steve Manos announced a shuttle bus plan in a "poppy apocalypse update" on Thursday, but the buses just got stuck in traffic, like everybody else. On Saturday night, the mayor issued a bulletin-style Facebook post: "Residents have been screaming at the people directing traffic. ... Estimated 50,000 visitors. Twice as many as last weekend. ... It's insane." What't the deal haven't the citidiots ever seen flowers before? sounds like a pack of wild animals.........oh wait, i forgot: criminalfornia.